The netsuke is a toggle. Japanese men used netsuke to suspend various pouches and containers from their sashes by a silk cord. Netsuke had to be small and not too heavy, yet bulky enough to do the job. They needed to be compact with no sharp protruding edges, yet also strong and hardwearing. Above all they had to have the means of attaching the cord. In this example, there are a pair of holes ('himotoshi') on the bottom of the sandal. 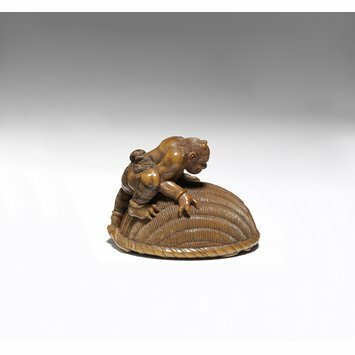 Although netsuke were made in a variety of forms, the most widely appreciated is the 'katabori' (shape carving). This is a three-dimensional carving, such as this netsuke. Shoki is a popular figure in Japanese folklore and a recurring theme in netsuke. Known as the Demon Queller, Shoki is represented with a fearsome exterior, large stature and grimacing expression seen to frighten away 'oni' or demons. By capturing or exorcising such demons Shoki could prevent illness, plagues and misfortunes that could harm the Japanese populace. Shoki originally trained as a physician at the court of the Chinese Emperor but due to his ugly exterior was prevented from serving the court. His shame made him take his life and the Emperor, in his sorrow, granted Shoki a burial with the highest honours. Out of respect for the Emperor Shoki would continue to repel oni. From the 18th century onwards, many more makers signed their netsukes. This example is signed Tomokazu. Tomokazu (flourished c.1760-1830) was predominantly a wood carver living and working in Gifu, Kyoto, Nagoya and other areas around Japan. His netsuke of Shoki under a basket is beautifully formed and humorous with the seemingly fearsome figure of a demon queller trapped under a basket. The entire circumference of the netsuke is intricately carved with even Shoki’s clothing bearing a distinctive textile pattern.